My son walked in to the office the other day with an old Chevy part in his hand and asked, "Dad, how much is this worth?" I looked at the part and then back at my son and said with a smile "Don't know, guess you're gonna have to sell it to find out!" I'm actually quite amazed at the direction the entire hobby has gone. If you had asked me 40 years ago when I started Classic Chevy to project the value of Classic Chevy's today, I would never have guessed they would be as valuable as they are. 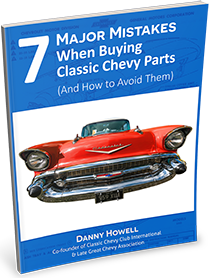 Buying a Classic Chevy and Don't Want to Get Screwed? Have you ever purchased a project car from another state only to discover that when it arrived at your place it was a lemon? Have you ever bought a car through Craigslist or Ebay or from a friend of a friend and learned (after it was too late) that the pictures you were shown didn't show everything? I make a living selling old Chevy parts and I have been doing this since the early 1970s. What started as a hobby exploded into a massive community of fellow classic Chevrolet car buffs. As much as I would love to sell you parts, I'm not in this business simply to make money. I am a hobbyist myself. I enjoy helping people track down that elusive part and get their classic Chevy dream car one part closer to completion. Whether you are about to begin a project, or have already made this plunge, this parts guide is for you. I put it together to help you find what you need, discover what you didn't know you had, and make your restoration process a whole lot easier. The first generation of the Chevy Caprice was truly the greatest among all its later releases. This masterpiece of Chevy automotive engineering redefined the standards for cars that were currently making the top-line series for Chevy automobiles. The Impala had already enjoyed success, and this counterpart to a vehicle of this size offered a refreshing and innovative contrast. The Estate version of this model also made some landmarks in the world of automotive releases. The Caprice was the first car released by Chevy since 1954 to feature simulated wood grains as an extremely prominent feature of the total aesthetic design. At the heart of every person who loves their vehicle lies the instinct to improve, adjust and tune to the car lover's specifications. The African American community has fully participated in this notion with Chevrolet and other General Motors models throughout the last 50 years. Chevrolet cars, trucks and SUVs are very ordinary road vehicles, but the influence of the black community has put new life into each model with modifications to enhance each standard factory model into an ultra unique expression of individualism.